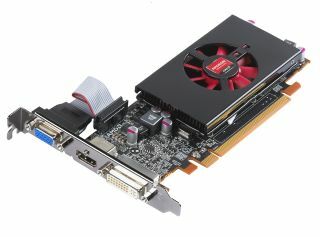 AMD has announced the Radeon HD 6670, Radeon HD 6570 and Radeon HD 6450 series of cards. AMD says it's building on the success of DirectX 11 cards thus far, having shipped 35 million units as of the end of 2010. Expect various announcements from board partners to emerge throughout today, with low price points very much in prospect. There'll be a full review soon on TechRadar. At a pre-briefing for the press, AMD's senior product marketing manager Trupty Vora lauded the new cards. "2011 is the year of DX11. We now see that the developers are only developing for DirectX 11. So the time to upgrade to DX11 is now"
Responding to one question about the limited extra feature set of these cards over the HD 5000 series, Vora said "There are a number of features, here like HD 3D Blu-ray playback that are improvements and that will offer you a very good experience." "Detail like clouds, water and shadows, that just don't appear when you're playing with a competitor's solution." Vora showed off missing weapons on a couple of screens from Total War: Shogun 2 – which is not yet a DirectX 11 game. The competiting solution used to demonstrate the was an Intel Sandy Bridge Core i5-2500K processor with Intel HD Graphics and Vora avoided getting drawn into any comparison with Nvidia, dodging a question, however Vora was keen to talk about the power efficiency of the cards. The new cards use 40nm Turks and Caicos chips – part of the Northern Islands family that also includes the mid-range Barts and high-end Cayman products. Display outputs: HDMI 1.4, DP 1.2, DVI, VGA. Available Display outputs: HDMI 1.4, DP 1.2, DVI, VGA.